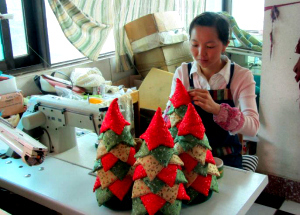 Deaf artisan Lei Mei enjoys steady employment with Hearts and Hands. Lei Mei, of China, was 25 when she suddenly lost her hearing. She’s not sure exactly how it happened, but it seems likely that a complication from tuberculosis medication was to blame. Whatever the cause, it was a devastating blow to Lei Mei, who had been working as a salesperson. She knew that being deaf would cost her her job. She was right. Her future looked bleak. She was told that the only way she could hear again would be a cochlear implant, costing her US$30,000. She had been earning approx. US$200 per month and paying all her costs out of that. This purchase, then, was impossible. She hated her family’s suggestion that she go to the family’s farm where she would do menial work and earn a pittance. Instead, she tried selling goods on the street at night but, with her hearing challenge, this was harder for her than others in the noisy marketplace. With just two years’ schooling, her options looked miserable. 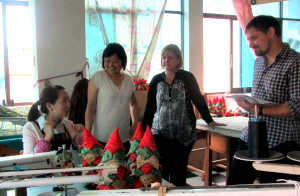 Global Handicrafts staff meet Lei Mei and other artisans on a field visit to China. See samples of our product range here. Got a question? We may have the answer here!